Today is the 50th anniversary of the assassination of Dr Martin Luther King, one of the greatest figures of 20th-century America. Inevitably there will be much discussion of his legacy and significance, such as was heard last week on the BBC Radio 4’s Sunday programme (@ 36mins), where Professor Robert Beckford and Dr Kehinde Andrews appeared to draw the conclusion that Dr King was moving towards radicalism and black separatism at the point he died; that he would, accordingly, have been a modern-day proponent of the ‘Black Lives Matter‘ (BLM) movement. I disagree. Some might say that I have no business to do so, as a white male of advancing years, but I was of the generation that compulsively watched the news reports on the only two television broadcasters of the time. Virtually the whole country was engaged with the drama of the Civil Rights story as it unfolded. Dr King’s Christian witness for justice probably influenced my choice of career as a lawyer, and my subsequent trips to the USA have been punctuated by visits to his tomb, the churches where he served, and the places of significance in his life. The more I see, read and learn, the more I am convinced that we need to resist the revisionism of the left and reclaim the MLK legacy for radical Christian inclusivity with a conservative tinge – where it belongs. Of course he would have grieved and advocated for poor communities that still find themselves marginalised from mainstream America, but his vision was characterised by making the country live up to its historic promises. His was a call to responsibly exercised citizenship rather than a descent into self pity, sullen resistance and victim status. You will never understand him without appreciating the importance and significance of his father, Martin Luther King Snr – known as ‘Daddy King’. He was in many ways an even better man than his son. The son of a slave, he rose from rural poverty and a modest education to become the pastor of one of Atlanta’s leading African American Churches. It was to this man of stature that former Georgia Governor Jimmy Carter timorously turned, sounding him out and asking his opinion of an intention to run for President. “Of what?” was his initial discouraging reply, though later it was Daddy King who was asked to propose Carter at the Democratic Convention. Hesitant to be identified as party political, Daddy King did feel able to endorse a man he judged to have integrity. That was a King family core value. MLK was brought up in the Atlanta Black community which saw itself as building ‘The New South’. His boyhood home was comfortably middle class, and the community had built businesses and created wealth, not least during the post-war boom. When, in 1951, Jackie Brenston recorded what was arguably the first Rock ‘n’ Roll record ‘Rocket 88’, he was exuberantly expressing the pride of a young black man attracting the girls, having bought the latest Oldsmobile muscle car. Aspiration abounded. He also imbued his son with a deep respect for his hero Mahatma Gandhi and non-violent protest as the only moral way of advancing challenge to government. As Gandhi taught, it is “the sword that heals”, and one only has to fast-forward the story to hear the repentance of Alabama Governor George Wallace or Democratic Senator and former ‘Exalted Cyclops of the Ku Klux Klan’ Robert Byrd to appreciate that hearts and minds were changed by such an insistence. “I will not stoop so low as to hate any man,” taught Daddy King. It is instructive to contrast the images of the March to Selma with the current ‘Black Lives Matter’ protests. In the former, dignified people, soberly dressed, suffered the violence of a police riot. With Christlike patience, they accepted the hatred and blows of their opponents; indeed, in advance, they specifically insisted among themselves that if you could not hold the discipline of turning the other cheek, you had no place on the march. Through such forbearance, insupportable injustice was manifest to the court of world opinion. The marchers relied on the unequivocal promises of the US Constitution as amended (almost exclusively by the votes of Republicans) to clarify and underline that black Americans had an equal place and an equal claim to the American dream. As I listened to Professor Beckford and Dr Andrews on Radio 4, I was dismayed to hear them suggesting that the MLK story was one of failure, and that the more confrontational, rejectionist and sometimes violent alternative propounded by Malcolm X and ‘Black Lives Matter’ offers the way forward. I well recall the Black Panthers strutting in their Che Guevara berets and their adulation of 60s African despots like Kwame Nkrumah: on hearing of Dr King’s death, the separatist voices of racial identity politics strengthened, and now we can look back and see the statistical consequences. The pay gap between black and white Americans narrowed during the years of Dr King’s influence and leadership, post-war up to 1970, and yet ever since then it has widened. That is worth a moment’s thought. Pre-Clinton, Dr King and his father knew that there was nothing wrong with America that could not be put right by what was right with America, but that was often forgotten within the emerging liberal zeitgeist and more radical elements within the black community. Bloc identity politics within the African American community did it few favours. The worst cities to live in have been single-party fiefdoms for decades, and as complacency and corruption flourished, nobody has suffered worse than the marginalised African-American poor. One of the most excoriating critics of this is black commentator and former Marxist Dr Thomas Sowell, whose own brand of moral conservatism (without a specific Christian dimension) owes much to Dr King’s example. He points out that other marginalised minorities – Jewish, Korean, Chinese, etc – have not only flourished in the face of racism but have overtaken white America in the league tables of wealth and success. He points out that we would all struggle to name a ‘community leader’ from any of these groups. Martin Luther King Jr would have been horrified that 70% of US black children are now born into fatherless families, especially in light of the clear link that Dr Sowell and others have evidenced between such absent-father families, educational failure, and criminality. It is not an absolute correlation, but it is certainly statistically too significant to be ignored. Between that and the tolerance of drugs, poor black America bought into the promises of liberalism and were failed dreadfully. By any consistent standard, a masked thug looting a community store or hurling rocks at police is a criminal, not a ‘Social Justice Warrior’ or an ‘activist’. Dr King was very clear on this matter. His answer was nevertheless clear and uncompromising: he led them toward the path of non-violence and was still insisting on it in final speech as he described himself as “a drum major for Justice” but also “a drum major for Peace”. Paradoxically, being arrested was part of that refusal to be defined. Like Gandhi before him, MLK submitted to arrest willingly, for he needed to demonstrate lawful power being shackled to unjust outcomes, which is all the better to challenge and change it, and change it he did. 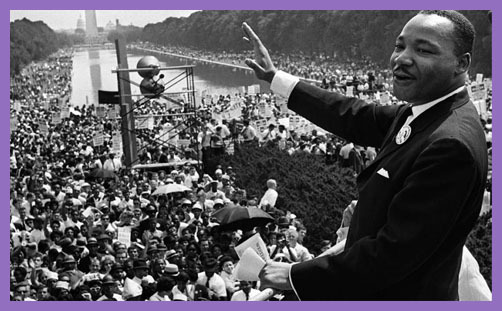 Not only did Dr King’s life change America, it touched ordinary lives. His reason for going to Memphis where he was murdered was to support a strike of sanitation workers, two of whom had been killed when they took shelter from the weather in a garbage crusher which malfunctioned. Black workers were not only paid less than white workers; they were not paid overtime and got nothing at all if they could not work because of illness. Dr King was not consorting with celebrities, Hollywood A-listers, politicians or sports stars, but ordinary working people whose work might be lowly but it was not without dignity. They were worth equal wages and equal terms of employment, and their dignity was worthy of affirmation. There was honour in honest work to support themselves and their families. That dimension sometimes seems to have slipped off the agenda of those lecturing us on ‘social justice’. To adapt the words of the old song, “Everybody wants to ride the road to social justice, but no-one wants to maintain the bus”. When the Architects of our Republic wrote the magnificent words of the Constitution and the Declaration of Independence, they were signing a promissory note to which every American was to fall heir. This note was a promise that all men, yes, black men as well as white men, would be guaranteed the unalienable rights of “Life, Liberty and the pursuit of happiness”… “We refuse to believe the bank of justice is bankrupt… so we’ve come to cash this cheque that will give us upon demand the riches of freedom and the security of justice. That remains as true today as it was then. There is no need for new rights or a new social settlement. This can and should be made as functional for the black children of the inner-city projects as it is for the successful children of the Vietnamese boat people. It worked for Ben Carson, Bobby Jindal and Condoleezza Rice. There are two men I am supposed to hate. One is a white man the other is black, both are serving time for committing murder. Earl James Ray is imprisoned in Tennessee charged with killing my son. Marcus Chennault was institutionalised as deranged after shooting my wife to death. I don’t hate either one. There is no time for that and no reason either. Nothing that a man does takes him lower than when he falls so far as to hate anyone. Hatred is not needed to stamp out evil despite what some people have been taught. People can accomplish all things that God wills in this world; hatred cannot. If we achieved victory over anything in the South it was over inhumanity. When the evil heart of segregation could beat no more it was because it had been stopped by people who did not counsel violence, who did not brutalise and bomb, who never sought to take away any part of anyone else’s humanity as a human being. These things triumphed over the exaggerated power of hatred. And so which path would any man who knew this choose to travel. Hatred did not win. I prefer to share triumph. 50 years after that triumph, we should remember with gratitude the life of Martin Luther King Jr – and give thanks also that the world was blessed by his remarkable father.